I apologize for posting so late today. I had a busy day working in the stamp room, having lunch with a friend, and doing some shopping before I leave for Leadership on Tuesday. I hope you'll think the wait was worth it! I LOVE this card! I made it for a Leadership dinner a few online friends and I are having on Friday night. I made ten of these and ten was enough, it took me many, many hours to make them. 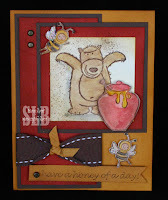 When I first saw the new preview set Just Buzzin' By, my first thought was now I have a honey jar to go with my bear! Just so you know the set is precious just the way it is, it features three charming bees, a very nice hive, the honey pot, a flower and two verses. But I knew I had to pair the honey pot with my bear. I had this idea in my head for weeks and finally sat down earlier this week to get it on paper. All supplies from Stampin' Up! Here a picture of some of the detail on the card. I used Crystal Effects to make the honey have a shine to it and I used Crystal Effects and Dazzling Diamonds to add some sparkle to the bees wings! I hope you have a great time at Leadership! They will love your card! Sharon I just love this card. You are really talented. Sharon, this is so cute, Have fun at Leadership, wish I could be there. Look at all the details on this card! I don't know if I would have had the patience to make 1 much less 10. Have fun at Leadership! !